Ford’s a leader in hybrid cars. The blue oval brand may be far from Toyota, but among non-Japanese manufacturers, no one has ever sold more hybrids than Ford. The brand currently sells hybrid versions of its Escape and Fusion. There’s also a Lincoln model, and the future looks bright with 2 new models announced at the Detroit motor show. 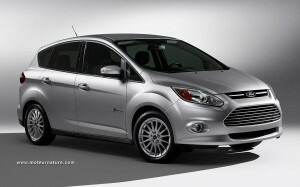 Both are based on the new Focus C-Max model. One is a regular hybrid, I mean cordless, it’s named C-MAX Hybrid, whereas the other one is a plug-in, and goes with the name of C-MAX Energi (yes, Energi, that’s Ford spelling). From what is known at this time, they will share their complete powertrain, the only difference being in the size of the battery, which will be lithium-ion for both. As a green car fan, I’m very enthusiastic about both models. But I’ve got the feeling that Ford isn’t sure about itself with those 2 models. 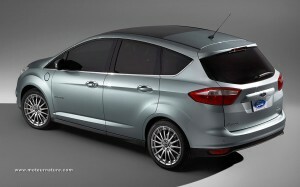 The Ford Focus, if it were available as an hybrid, would be the most direct competitor the Toyota Prius could get. But Ford has chosen to launch its new hybrid powertrain on the minivan version of the Focus, instead of the regular Focus (hatchback or sedan). So Ford will not compete against the Prius yet, it will start with an attack on the just introduced Prius v. How good will the C-MAX Hybrid be against it? We don’t have a clue yet, as Ford hasn’t released a spec sheet. The engine displacement, or the motor’s power, nothing’s been revealed. I suppose Ford was waiting for Toyota to reveal its fuel economy figures for the Prius v. Ford engineers now have a clear goal: to beat it.